FORM-PRO is a joint project of FRIENDSHIP SYSTEMS, TUHH (Hamburg University of Technology) and HSVA (Hamburg Ship Model Basin), which started in November 2009 with a prospective run-time of three years. It aims at the development of simulation methods for the hydrodynamic form optimization of ships under propulsion. a minimization of vibration-inducing force fluctuation on the blade. The optimizations are to facilitate the design of ships and appendages with positive performance characteristics. The ultimate goal is to reduce needed power and demanded fuel for the individual transportation task. This involves a better propulsion performance and a higher (energy) efficiency. Fundamental idea of FORM-PRO is that hydrodynamics can contribute massively to reduced fuel consumption as well as to an enhanced economic viability and improved eco-friendliness of ships. However, it goes without saying that necessary developments in engine technology are vital, too. FORM-PRO’s activities are intended to serve as a methodical basis for the development of innovative ship forms and shall too help enhance their propulsive properties. Unlike ongoing research, FORM-PRO focuses both on bulky single-screw vessels and on rather slender twin-screw vessels with appendages, for example bulkers, tankers, ferries. This covers a broad range of application. FORM-PRO’s approach is to, for the first time, combine parametric form description and adjoint RANS technology. This shall establish an integration platform for the viscous optimization of aftbody forms, including hull, propeller and appendage interaction under active propulsion. 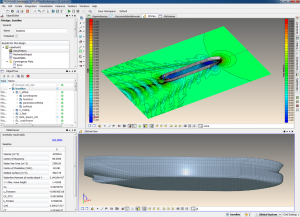 Thereto, methods of parametric form description, mathematical optimization and flow simulation need to be further developed. The parametric description of ship forms and appendages (single and twin-screw ships) and the whole optimization process will be done within CAESES. All three project partners will develop, document and test suitable parametrizations. The hydrodynamic simulation, which brings about valuable insight into the ship’s propulsive performance, is based on Reynolds-averaged Navier Stokes equations (RANS). For their solution an unstructured finite volume code (FreSCo) is used on the basis of an implicit pressure correction algorithm. An adjoint sensitivity analysis, which is integrated in the hydrodynamic target functions, allows to optimize the ship form under consideration of an unlimited number of degrees of freedom in a very short time. The technical integration of the adjoint RANS solver into the CAD-CFD platform CAESES is done by FRIENDSHIP SYSTEMS. 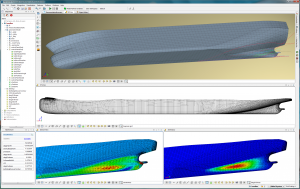 In a next step, the newly established parametric models will be coupled with the solver through further developed optimization methods. This is thought to help generate and assess automated variations of the ship forms in future use. The optimization and the manual variant generation as a consolidated and efficient process chain in CAESES. shall help the designer to achieve a measurable reduction of propulsive power for the respective ship type. This is intended together with an overall more homogeneous flow to the propeller so as to reduce force fluctuation, cavitation and other unwanted effects on the blade. Eventually, this protects the flow exposed surfaces from abrasion and secures a stable performance. As the project continues, constant updates of results will be published on this website. The project runs under the umbrella of a development program of the German Federal Ministry of Economics and Technology (BMWi)* which is entitled Schifffahrt und Meerestechnik für das 21. Jahrhundert (Shipping and marine technology for the 21st century). This program strives to enhance the competitiveness of the German shipbuilding industry—and as such it supports the development of new and innovative products and methods, particularly focusing on the safety and economic viability of marine products and processes. With this programmatic background, FORM-PRO tries to provide solutions to a challenge of global scale and scope in 21st century shipbuilding and operation: How to reduce fuel consumption, how to provide transportation at minimal propulsive power, how to increase efficiency that is.